These days, I have been sensing a general sense of despair and fatigue among people I know. While there are those who appear to be well and happy, there are also those faithful ones who serve each week, without complaining, and earnestly wanting to help people. Looking at Paul's encouragement to the Colossian Church, I am intrigued at how he is willing to send a dear brother like Tychicus to encourage others. I like to play the role of Tychicus this week, to focus on ten brief thoughts specifically to encourage fellow servants, ministry workers, and those simply desiring to do more for God. On People: As I look at the way God had been faithful to Israel, if there is any one person who ought to be most discouraged, it would be God, having to deal with a stubborn Israel and ignorant mankind. Yet, God continues to speak to us. He has used the Patriarchs of old; the Kings; the Prophets; the Priests; the Early Church and Disciples. Still, in spite of man's disobedience and unfaithfulness, God continues to keep His end of the bargain. It is because God has not given up on us, we ought not give up on fellow people. 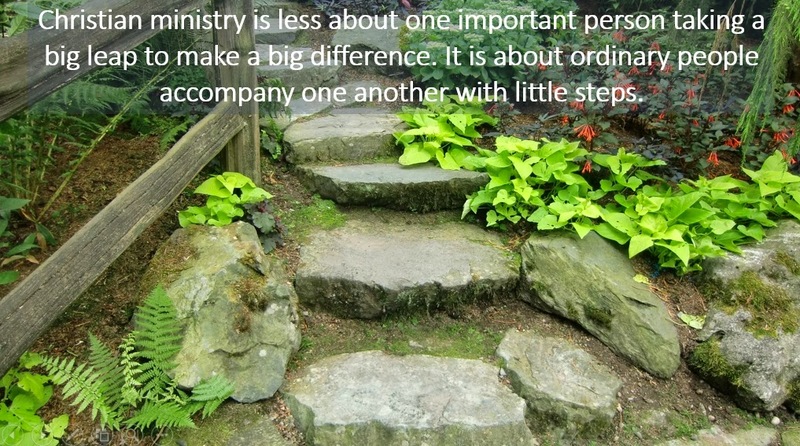 On Ministry: The demands of ministry is great. Due to varying amounts of expectations, there is no way one can ever meet all the demands of all parties. Something invariably had to give. Remember this. When we minister as servants of God, we are not in charge of the ministry results. God is. Moreover, God did not say that whatever we do, we will get success. God desires us to be faithful and in God's good time, God will be the agent for all forms of fruitfulness. Plant and water away! Doing More: It is easy to straitjacket ourselves to do more, to be more, and to invest more. In a world that seems to promote size, volume, quantity, and all kinds of quantitative bigness, it is good to be reminded that just like the poor woman with only two coins, or the words from Peter who had not gold nor silver, but the Word of God, so we too need to remember that in God's ministry, just like the confession of John the Baptist, less of us means more of God. On Evangelism: According to Kent Hunter, a Church leadership consultant, Evangelism is the biggest struggle among Christians. Perhaps, it is a erroneous mindset many people had from the beginning. I have always told people. Conversation is our responsibility; Conversion is God's. On Spiritual Growth: How do we grow spiritually? Some pay big bucks to attend conferences and retreats. Others work through a rigorous program or a multi-step process to inject some spirituality into our jaded faith. It is good to remember that just like the seed story in Mark 4:27, "Night and day, whether he sleeps or gets up, the seed sprouts and grows, though he does not know how." Spiritual growth is the Lord's. We just need to be ready always. On Church: Week in week out, we hear more negativity about the Church than good news. Moreover, a Church as the Bride of Christ is supposed to be the bearer of Good News. It's true that the Church is grossly imperfect. Yet, the Church is not totally bad as some parties paint it to be. Among the bad perceptions, remember too that there are always genuine people within. There are always those who serve without complaining. There are faithful brothers and sisters who serve not because of pleasing people, but because they desire to please God. Find a few such brothers and sisters and fellowship with them. On Leadership: Some of us have been called to be leaders in various capacities. Whether in Church, at work, or in some organizations we are involved with, leadership is something we grow into. It does not happen automatically. Remember this one thing. In becoming a leader, the first person we ever lead is our own selves. Be confident in leading ourselves. As the patterns develop, and as we become followers of Jesus, people will watch us. Let our leadership grow as we follow hard after God, and be examples for others to follow hard after God. After all, leadership is both relying on examples for living as well as living by example. On Prayer: Perhaps, we have become associated with guilt whenever we fail to pray enough. Maybe, our own prayers seem to be before meals or during Sunday morning services. Don't worry. It is a process. In fact, Jesus has encouraged us not to be distracted by people who utter long prayers. The shortest prayer uttered with honest feelings will cover greater spiritual mileage. This is exactly what the Jesus prayer is about. Short, simple, and very spiritual. "Lord Jesus, have mercy on me a sinner!" On Social Media: Sometimes, it can be rather discouraging for those of us who have few friends. Few people comment on our posts. Even fewer bother to add us as their friends. It can leave us feeling very unappreciated or unwanted, especially when we see others having tremendous following and popularity in their social media profiles. Note that like all things, beauty is fleeting. Popularity can work both ways. Fame can easily turn into infamy in 1 day. Do not be discouraged by the many who ignore us. Be encouraged by the genuine few who care for us. On Writing: Many of us who write encounter the writers' block from time to time. We try our best. We sit for hours. We load ourselves up with coffee, ambiance, and all kinds of writing resources. Yet, the ink never flows. Like my good old Professor at Regent College says: "All good writing is re-writing." Go ahead and write away. Do not expect Pulitzer Prize quality to appear from the first stroke of the pen or the initial tabs of the computer keyboard. All good writing comes after lots of editing, re-writing, and re-phrasing. In fact, based on my own writing experience, all good writing comes from faithfulness. Once the first words are on paper, the creativity and the ideas come once the editing process kicks in. All good writing is re-writing, and re-writing, and re-writing.